Vera Natura has one of the most beautiful communal gardens of any complex at Vera Playa. The gardens are luscious and green which is unusual in this area because of the constant sunshine and little rain that this area enjoys. the reason Vera natura has such lovely gardens is thanks to the hard work of the gardeners cutting and watering the lawns and constantly attending to the gardens. find this very refreshing as a respite from the strong Spanish sun. There is also a jacuzzi alongside the outdoor pool and a small children's paddling pool. The indoor pool is heated and is usually pleasantly heated. 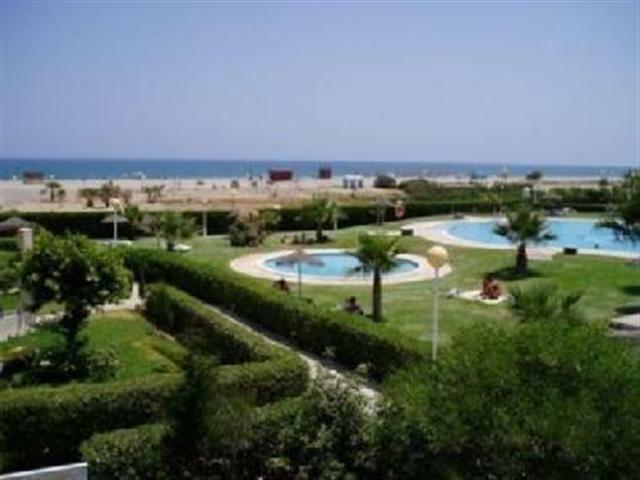 There is a relaxing communal area where you can often find a game of boules taking place and a library/games room with table tennis providing books and magazines to borrow while topping up your tan by the pool. 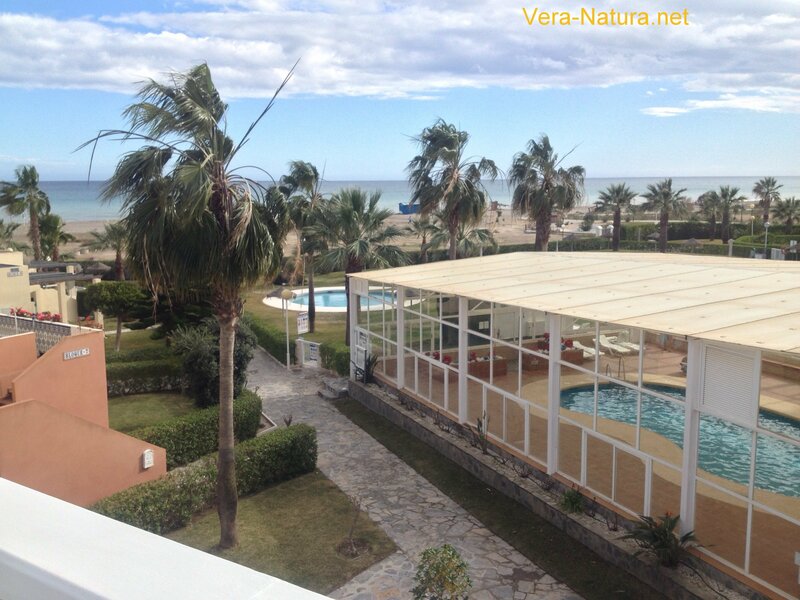 From the apartment it is a short pleasant walk through Vera Natura gardens to the beach passing through palm trees, around a water fountain, past the swimming pools to the gate which opens onto the long naturist beach of Vera Playa that you can see in this picture. 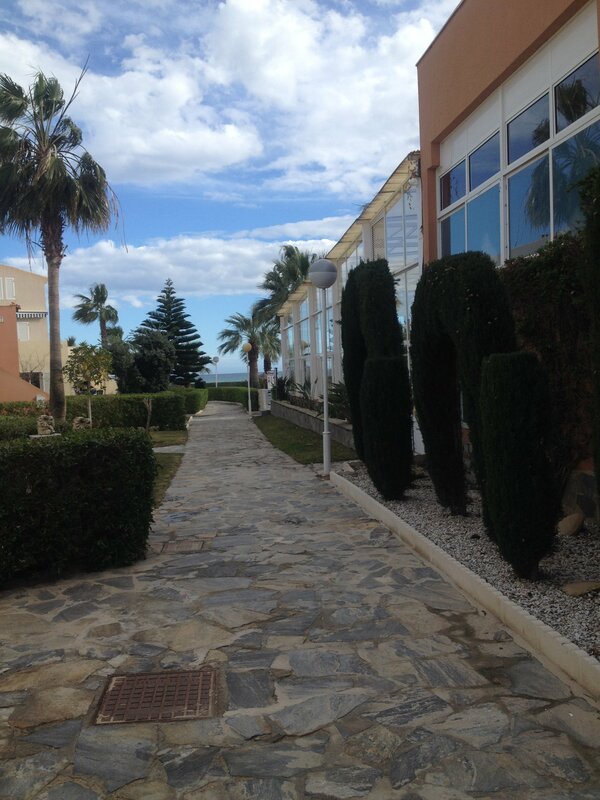 This is the walk to the sea, you can see the indoor pool on the right and the sea at the end of the path.